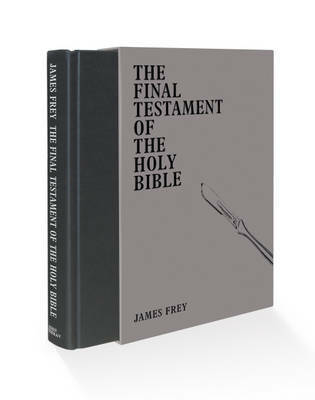 A signed, numbered edition, that is slipcased, with head and tail bands, ribbon marker and limited to 1,000 copies James Frey isn't like other writers. He's been called a liar. A cheat. A con man. He's been called a saviour. A revolutionary. A genius. He's been sued by readers. Dropped by publishers because of his controversies. Berated by TV talk-show hosts and condemned by the media. He's been exiled from America, and driven into hiding. He's also a bestselling phenomenon. Published in 38 languages, and beloved by readers around the world. What scares people about Frey is that he plays with truth; that fine line between fact and fiction. Now he has written his greatest work, his most revolutionary, his most controversial. The Final Testament of the Holy Bible. What would you do if you discovered the Messiah were alive today? Living in New York. Sleeping with men. Impregnating young women. Euthanizing the dying, and healing the sick. Defying the government, and condemning the holy. What would you do if you met him? And he changed your life. Would you believe? Would you? The Final Testament of the Holy Bible . It will change you. Hurt you. Scare you. Make you think differently. Live differently. Enrage you. Offend you. Open your eyes to the world in which we live. We've waited 2,000 years for the Messiah to arrive. We've waited 2,000 years for this book to be written. He was here. The Final Testament of the Holy Bible is the story of his life. Author of A Million Little Pieces and the Lorien Legacies series.